Smoke alarms can mean the difference between life and death in a fire. Working smoke alarms cut the chance of dying in a fire in half. 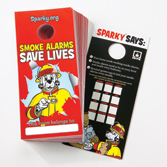 Use these NFPA following resources to conduct a smoke alarm awareness campaign in your community. Three out of five home fire deaths happen in homes with no smoke alarms at all or no smoke alarms that work. When there is a fire, smoke spreads fast and you need smoke alarms to give you time to get out. Take this quiz (PDF), and find out if you know all you need about the smoke alarms in your home. 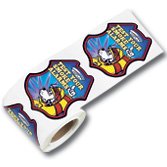 Use Sparky® Smoke Alarm Stickers to raise fire safety awareness! Customize these resources and work with local media to help spread the word about smoke alarms.